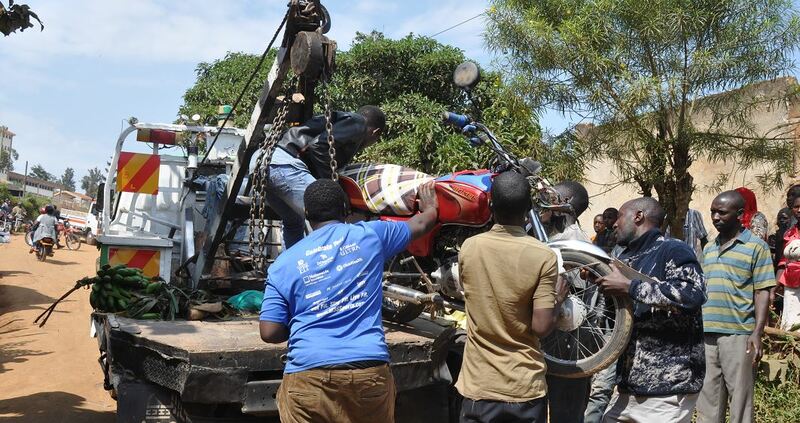 MBARARA – Shock and grief rocked residents of Kiswahili suburb in Mbarara town on Thursday afternoon when a boda-boda cyclist who was carrying three passengers rammed into a moving tipper truck killing two people on spot. Samson Kasasira the Rwizi Region Police mouthpiece confirmed the incident, saying the rider and a juvenile of about 10 years died on spot whereas other two women were rushed to Mbarara regional referral hospital in critical condition. He mentioned that the accident happened near Mbarara Municipal primary school on the lane connecting Lugazi road, that the bodaboda rider Reg.No UDT 075A had three passengers including and him the fourth and had a big bunch of matooke behind. Bodaboda riders have attributed this accident to overloading and narrowness of the road. Francis Agaba also a boda-boda rider called upon the municipal leaders led by Mayor Robert Kakyebezi to ensure they enlarge the road to avoid such accidents. “You see when you are slopping here and happen to meet a big vehicle, it’s a must you have to first stop, so the road is very small and has big trenches on both sides so our leaders should immediately come and expand the road.